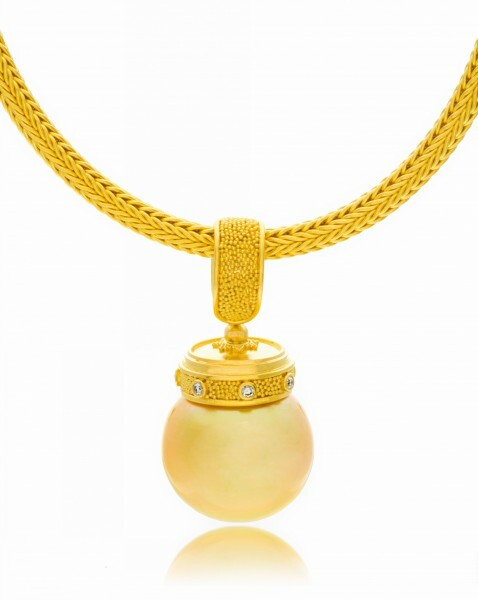 22K yellow gold pendant featuring a beautiful golden South Seas pearl with natural color. Approximately 15.5 x 17mm. Adorned with .06 ctw diamonds. Shown on 22K gold 3.25mm Hand-Woven chain (sold separately). This piece is available for reproduction. As pearls come from nature, pearl sizes are approximate.